This is a tough one - how do I choose just one book I love to read aloud? I had to think hard to answer this question. I finally decided on Farmer Brown Shears His Sheep, by Terri Sloat. I got this book when the girls were small, and I love it. It rhymes, which I've found makes any book easier to tolerate for repeated readings. We read this one a LOT. "Farmer Brown was shearing sheep, piling up a snowy heap, of wool that filled his shed knee deep. Clip, clip, buzz, buzz, he took their wool and left them fuzz!" See? I still have it memorized! Good thing I enjoy it so much. I will read it any time. My girls, who are 12 and 13, still like to hear this one. It also talks about the process wool goes through, from shearing to knitting, which I thought was cool. 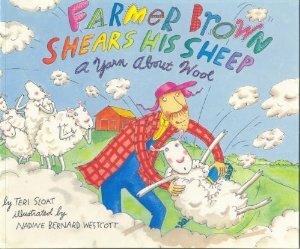 The "crisis" in the book is that the sheep decide they're cold after they're shorn, so they follow Farmer Brown, trying to retrieve their wool. Do they win? You will have to read the book to find out! Unfortunately, this book is out of print and it's not cheap to get a used copy. You might be able to find it at your library, though. What's your favorite book to read aloud? I am always looking for book suggestions, so please leave a comment and let me know!